Christine McGuinness has left her fans worried after posting a selfie from a hospital bed. 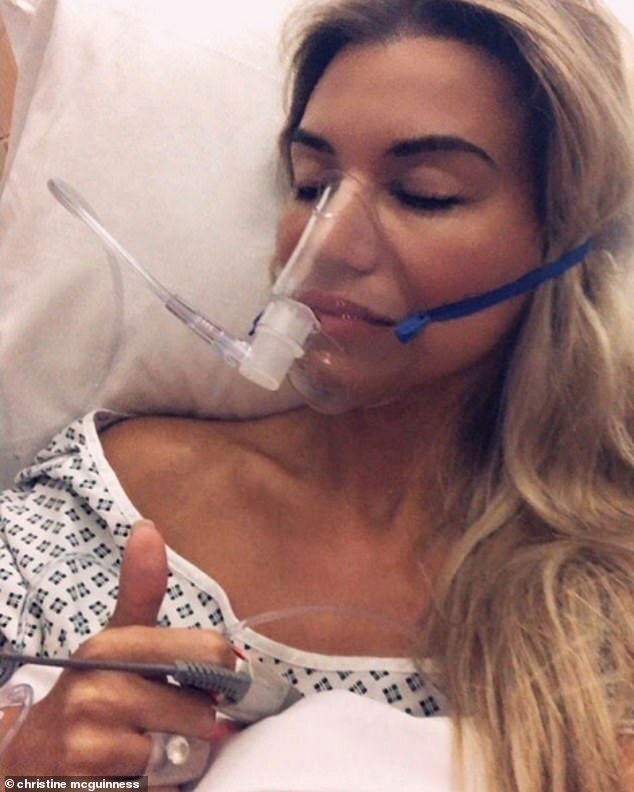 The stunning model, 30, took to her Instagram platform on Thursday evening with a snap of her sleeping while an oxygen mask was fitted on her face. 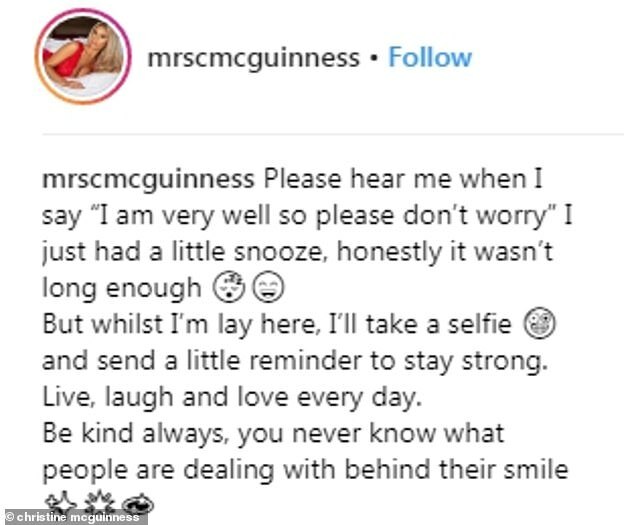 While it is unclear what Christine’s health woes are, the wife of TV star Paddy McGuinness assured her fans that everywhere was okay, while also urging them to be ‘kind to each other as you never know what people are dealing with’. Christine captioned the snap: ‘Please hear me when I say “I am very well so please don’t worry” I just had a little snooze, honestly it wasn’t long enough. ‘But whilst I’m lay here, I’ll take a selfie and send a little reminder to stay strong. Live, laugh and love every day. ‘Be kind always, you never know what people are dealing with behind their smile,’ her caption concluded. MailOnline has contacted representative for Christine for further comment. The night before Christine appeared a-ok as she partied in London, stepping out in an eye-catching frock. The glamorous blonde took a walk on the wild side in a silky, tiger print number which plunged perilously. Christine’s hospital selfie comes after her recent revelation that she feels ‘happy, healthy and strong’ following her one stone weight gain over the last year. As 2018 drew to a close, the reality star took to her Instagram to share two clips of herself side-to-side. Christine explained that in the first video at the start of the year she felt ‘weak, broken and worthless’, whereas the second clip she felt ‘happy, healthy and strong’ going into 2019 after gaining one stone. She said: ‘I started 2018 feeling very weak, broken and worthless.. I’m leaving 2018 feeling happy, healthy and strong. Sometimes you have to hit rock bottom to get back up and realise how strong you are. ‘Everyone has good and bad times in life, focus on the good. Remember things do change so never make a permanent decision on temporary feelings.